Our story begins in 2000, when we contacted Adoption Associates to discuss our options regarding Adoption. 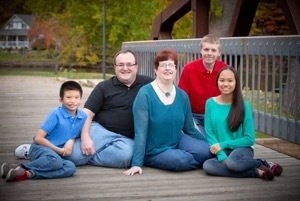 We joined the China program and were blessed when our daughter was placed in our arms in January 2002. Our son was 6 six years old and our new daughter was a year old. We thought our family was complete. There was, however, another plan for us. In 2004 AAI received their first waiting children referrals. A little boy with big brown eyes seemed to call to us. We knew he had Microtia and a severe hearing loss. We contacted our doctors, talked to friends, and prayed. We took a step in faith and filed our papers in May 2004 to bring our son home. Did we have all the answers? NO! But we did know we had room in our house and lives to love a child. Our friends told us “Follow your Heart-you never go wrong when you follow your heart”. In November 2004, a crying baby with a runny nose dressed like the Michelin man was placed in our arms. We didn’t know who was more scared him or us. We were now a family of 5 and the adjustment process began. There were difficult times, but we had the support of the families that we had traveled with when we brought our daughter home. They understood the ups and downs of adding a new child to the family. We learned with his severe hearing loss sometimes all we could do was rock him and hold him to let him know we loved him and he was safe and secure. The first time he reached out for my hand, I knew we had broken through the wall. He was beginning to trust us. We have been asked if we thought about not bringing him home. Our reply was – not for a second. We knew he was our son and we would do whatever it took to give him a life. We live in a time of amazing medical advances. Joe has had several surgeries and now with hearing aids his hearing is in normal range. He is a typical middle schooler. He is an honor roll student who enjoys the outdoors, Minecraft, and woodworking. He is also an expert at Rubik’s cubes. Our advice to anyone considering a waiting child, DO IT! There will be challenges and bumps along the way, but the good days outweigh the bad days. You learn to appreciate every milestone, which may seem like an everyday occurrence to others. Step out in faith and follow your heart.